Abi Jay: ‘Am I wired up differently? 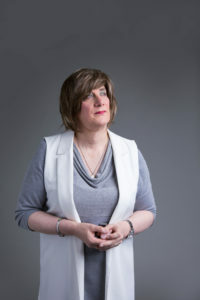 ‘You have to have something to believe in…to have a focus of something because trans people do go through a life of trouble…they just want answers…and you sometimes don’t know who to turn to, what to turn to…so you suffer on your own, having something from a spiritual point of view to turn to I think helps part of the way. For me, my journey has had a lot of situations where spiritualism have intersected my life’. Abi describes experiencing ‘biological feelings’ of pains in her stomach, growing pains, anxiety and anger. For a long time- just before her bar mitzvah right through to her marriage- it became apparent to her that these pains were occurring monthly, yet the actual source of these pains remained uncertain. Abi is sure angels are part of her personal journey. She feels ‘lucky to be able to sense there is someone looking after [her]’. Many inexplicable episodes and strange occurrences characterise Abi’s journey and make her feel as though there is a force that guards her. In terms of guardian angels and god she believes it’s ‘all one and the same’. Abi’s relationship with God has been complex. After many instances whereby Abi says God could have ended her life, including her own attempts, she considers God to be keeping her alive. Abi has become increasingly angry, confused and frustrated at her situation, feelings which at time she directed at God. She has had a surgical procedure on her voice box which has changed and altered the pitch on her voice. More recently Abi underwent gender reassignment surgery which she was currently recovering from at the time of the interview, during her 3-month recovery period. ‘So my life has sort of taken quite a few… it’s ebbed and flowed, there’ve been highs, there’ve been flows’ but for the moment Abi feels in a happy place ‘I feel almost complete now’. On identifying as intersex within the trans community as a whole, ‘I do need…the trans community to support me as I want to support it’. During and after her appointment with hospital, being told she was intersex and had had a fully functioning female organ throughout her life she describes as a ‘massive physiological blow’. One of the things she was most craving in this moment was someone to talk to afterwards, to share a story or experience with. Having to deal with this situation alone did mean Abi came out of it stronger. She now talks about creating her own group for intersex people to help others who have gone through, or are going through similar situations with regards to the intersex journey. ‘Intersex…it’s like a sliding scale, there’s various degrees of levels of intersex that you can be’. She goes on to say there are many different ways in which you can identify as intersex relative to your biology, mindset, attitude and experiences and there is not much information on this, no field or are of expertise: Abi herself would have benefited from more public information on her situation. In terms of defining herself differently as intersex from a trans* woman, Abi says perhaps the way one processes situations were different. In terms of her ‘faith and spiritualism that’s a constant rolling ball’, she acknowledges that she is still looking for answers and doesn’t know what is to come, she is still looking and searching. Abi feels the next part of her evolution is to help others ‘I think it’s now the chance for me to help others, I think that’s the next part of my evolution’.